Elliot Whittier Insurance Services LLC, with offices in Danvers and Winthrop, MA, recently earned the Five Star Agency Designation. The Five Star Agency Designation is awarded to those agencies that go through a vigorous review based on 5 imperatives: Customer Focus, Management/Leadership, Human Resources, Products & Processes and Future Success Initiatives. Upon earning a qualifying score, an agency becomes a Five Star Agency Designee. “Elliot Whittier is very deserving of this designation and has been recognized as one of the top agencies in Massachusetts. The strengths of this agency continues but at this point I will stop and simply say, that the Massachusetts Association of Insurance Agents is proud to announce that Elliot Whittier has earned the Five Star Agency Designation.” Said Frank Mancini, CEO of the Massachusetts Association of Insurance Agents. “We continually critique what we have and how we do things to see if there is a better way. We are fortunate that not only Steve and I do this, but our staff is willing to do it. Knowing our strengths and acknowledging our weaknesses makes us stronger," added Wayne Guyer, Principal of Elliot Whittier. 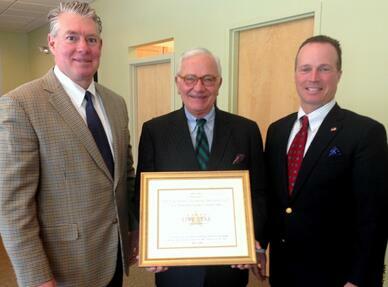 Pictured here is Wayne Guyer, Principal of Elliot Whittier Insurance Services, Frank Mancini, CEO of the Massachusetts Association of Insurance Agents, and Steven Roy, also Principal of Elliot Whittier. With offices in Danvers & Winthrop Massachusetts, Elliot Whittier Insurance Services, LLC has been awarded The Five Star Award of Distinction from the Massachusetts Association of Insurance Agents. Elliot Whittier Insurance is also a Trusted Choice® agency and represents multiple insurance companies, so it offers you a variety of personal and business coverage choices and can customize an insurance plan to meet your specialized needs. You can visit Elliot Whittier online at www.ElliotWhittier.com, email info@elliotwhittier.com, or call 800-696-3947.